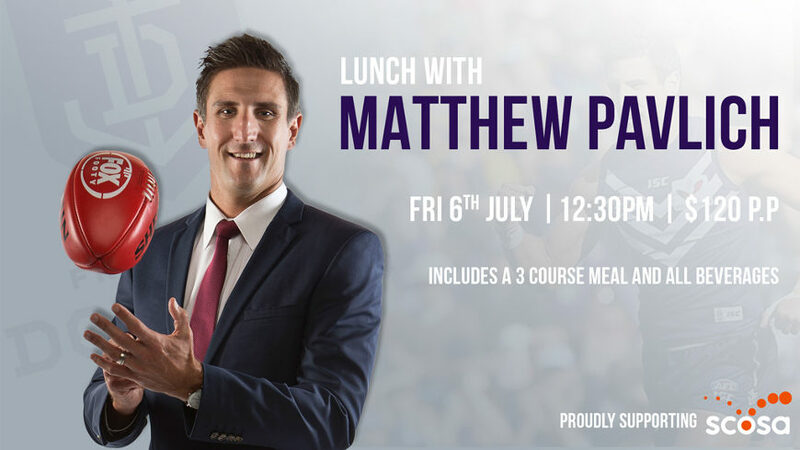 Join us for a fabulous 3 course lunch at The Highway with the premier AFL centre half-forward of the modern era, Matthew Pavlich! Pavlich, who needs no introduction, achieved All-Australian selection six times between 2002 and 2008. His amazing football career started at nearby Sacred Heart College where he was a student, then playing senior football for the Woodville-West Torrens Eagles before he was drafted into the AFL, playing for Fremantle from 1999. Your ticket price ($120) includes a 3 course luncheon and all beverages and part proceeds from this function are supporting scosa. As well as having a fabulous day, you’ll be helping to support scosa and South Australians living with disabilities.